As part of our Temple Library Collection, you can purchase printed copies of The Culture of the Teutons in both paperback and hardback versions. Both versions contain both Volumes 1 and 2 and are 6x9 books with 436 pages. Or you can download the free PDF of the book provided below. 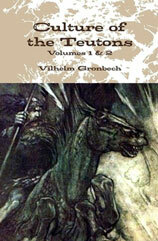 The Culture of the Teutons – Volumes 1 and 2 - Written by Vilhelm Grönbech, the Professor of the History of Religion at the University of Copenhagen, this three volume set was first published in Danish in 1909-1912. 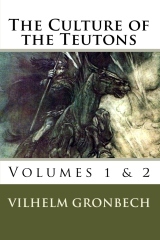 This PDF file is from an English translation published in 1931, and it contains Volume 1 of 3 which covers Frith, Honour, the Soul of the Clan, Luck, the Art of Life, Birth, Death, Immortality, and other topics. The PDF also contains Volume 2 of 3 which covers Treasures, the Sword of Victory, Name and Inheritance, Exchange of Gifts, Purchase and Pledge, Holiness, Temple, the Ale-Bowl, and other Germanic topics. Volume 3 is not avaible as a PDF file. Volume 3 featured a Bibliography as well as Additional Notes on: Urgard; Natures; Vadium; Handfesta; The Right of the Heirs; etc. It was 141 pages long, and a third the size of each of the first two volumes.